Since the time of George Washington, important leaders have ruled from the Oval Office. Learn about the first 44 Presidents of the United States, the times in which they served their country, and the challenges they faced as leaders of the world's most powerful nation. 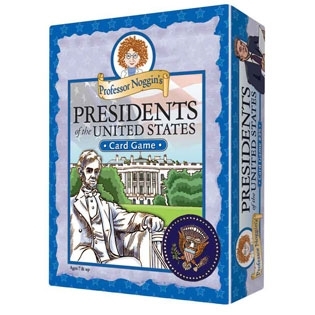 Professor Noggin’s series of educational card games encourages kids to learn interesting facts about their favorite subjects - like Presidents of the United States! Each of the thirty game cards combines trivia, true or false, and multiple choice questions. A special three-numbered die is included which adds an element of unpredictability. Easy and hard levels keep kids interested and challenged - while of course having fun!